Heat oven to 375°F. Cover potatoes with water. Let stand 15 minutes; drain thoroughly. Toss potatoes, margarine and 1 egg. Press potato mixture on bottom and up side of ungreased pie plate, 9x1 1/2 inches. Bake 20 minutes. Reduce oven temperature to 350°F. 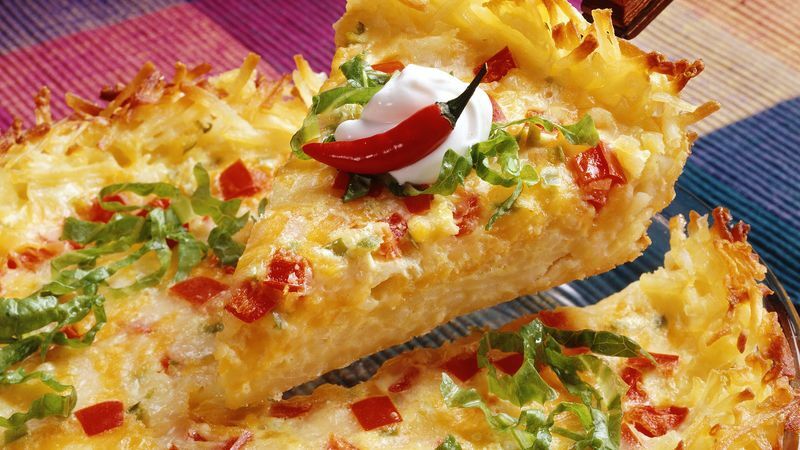 Sprinkle half of the cheese, finely chopped chiles and bell pepper in potato crust; repeat. Beat flour, salt and 2 eggs until blended; stir in milk. Pour over cheese mixture. Bake about 35 minutes or until center is set and top is golden brown. Let stand 10 minutes before cutting. Garnish with shredded lettuce, sour cream and sliced chile peppers. Add the works for toppers: sliced avocados or guacamole, chopped tomatoes and chopped fresh cilantro.